Are you ready for some NFL daily fantasy football? The NFL is set to kick off Thursday, September 6 when the Super Bowl Champion Philadelphia Eagles host the Atlanta Falcons. With it comes the return of daily fantasy football and Gambling.com is here to guide you through all the Week 1 action. Here’s our favorite picks at quarterback and running back for the opening slate of games. We’ve got low and high budget options based on the kind of roster you want to build on FanDuel. So let’s dig in! Andy Dalton was one of last season’s most popular NFL players. In Buffalo at least. Other than a dramatic win against the Ravens at the end of the season that sent Bills Mafia into hysterics, Dalton’s seventh season as the Bengals’ starter was a step back from a Pro Bowl 2016. The Red Rocket will be looking to bounce back in 2018 and an unremarkable Colts team gives him a perfect opportunity to have an under-the-radar solid Week 1 fantasy output. Speaking of bounce back years, Tannehill is back for a Dolphins team that’s been trying to take the next step for a few years. Will a healthy starting QB for a full season help the Phins get back to the postseason? It’s way too early to tell, but Tennessee’s defense is nothing overly special. Tannehill should be rearing to go after missing most of 2017 and win or lose put on a nice value play showing against the Titans. If your Week 1 field general tastes are a bit more expensive, go for Big Ben taking on the Browns. There’s, dare we say it, some positivity going around in Cleveland this year, but expect the Steelers to come in and most likely squash it. He may have flirted with retirement last offseason, but when Roethlisberger takes snaps against a low-end team, you can generally expect a great result. It should be an interesting week one duel between two signal callers getting the hang of their new teams while looking to impress. Even though Jimmy Garoppolo has been with the 49ers since last season, we like Cousins to show up in his first game as a Viking in a big way. As could be inferred from last season, Minnesota is loaded and while Case Keenum was a fine option last season, Cousins is a huge upgrade. In a breakout 2017/18 season, some of Kamara’s best performances came against the Bucs. In two division showdowns versus Tampa Bay, Kamara rushed for 110 yards and one touchdown while hauling in 14 receptions for 168 yards and 2 touchdowns. He may have a high cost, but with those numbers he’s an absolute must-play week one and should be worth every penny. Cook’s rookie year was off to a promising start until an injury in Week 4 knocked him out for the year. We think on a Vikings team that’s, as aforementioned, really good, he’s going to be a perfect counterpart to Kirk Cousins. He should get the Vikings rolling on the ground against a pedestrian Niners defense as he starts his campaign to make up for last year’s lost time. LeSean McCoy’s offseason has been absolutely dreadful. A groin injury is currently keeping the former pro-bowler out of practice, and there’s the possible suspension for a domestic incident that could still be on the way. The omens are starting to point to McCoy missing Week 1 and even if he does make the start there’s serious questions about how effective he might be. Luckily, Chris Ivory is a seasoned back with plenty of big play potential who should be ready to jump right in against a suspect Ravens rush defense. The hype around Saquon Barkely will be real early in the season, but Week 1 in New York may provide the perfect stage for a phenomenal NFL sophomore to show the rook how it’s done. Leonard Fournette rushed for 1,049 yards and nine scores in a stellar rookie campaign, and the Jaguars will be looking to pound the G-Men to show their tremendous 2017 was no fluke. 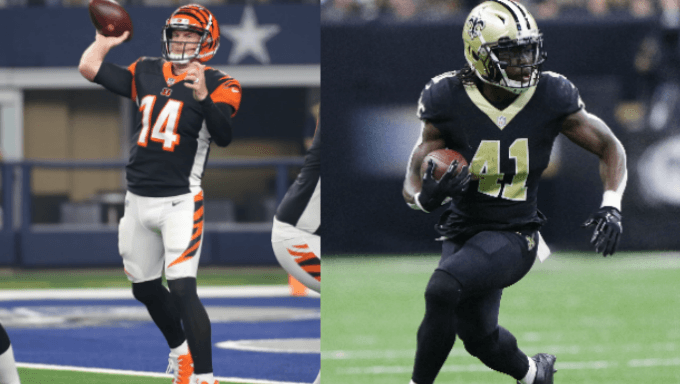 Playing their special brand of smashmouth football, expect plenty of carries for Fournette and a big day on the ground in the Meadowlands for Leonard.